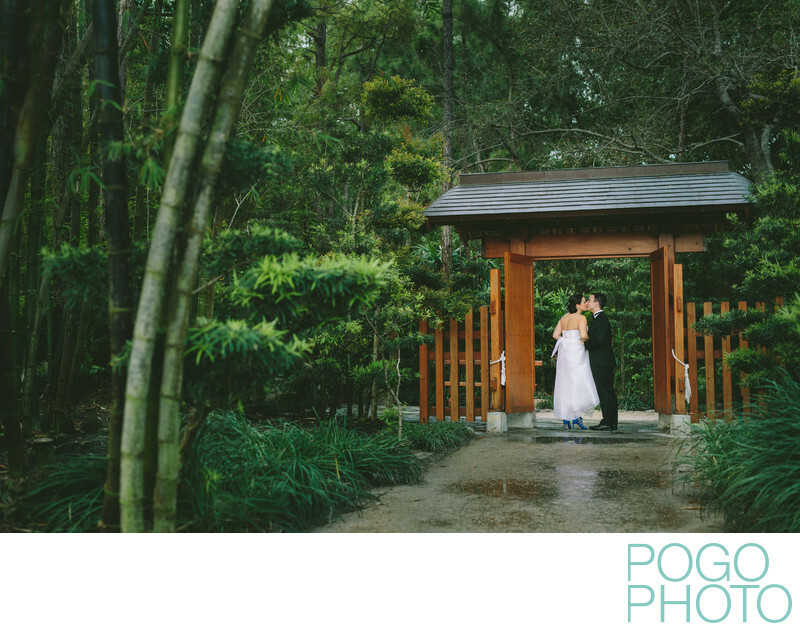 The Morikami Museum and Japanese Gardens’ bamboo forest is an excellent South Florida destination for wedding day portraiture, exemplified in this image we captured during the couple’s first look. Being a wedding photographer occasionally working in Delray Beach, Florida means we have the opportunity to photograph people in love at places like The Morikami. We visit this location often, as it is an easy drive for us from our home in Jupiter. Meeting clients from Boca Raton, Pompano Beach, and Fort Lauderdale can involve a lot of travel for all of us, but even our Miami brides and grooms can easily reach this unique destination. Open to the public from 10am to 5pm limits opportunities during golden hour, but hosting a wedding onsite not only allows for witnessing the glow in the sky but offers an excellent vantage point from which to watch the sunset reflecting in the lake. The Morikami dates back to 1977, but was inspired by a settlement of Japanese immigrants from over a century ago. Around the turn of the twentieth century, southern Florida farms grew an abundance of crops including pineapples. Today, America’s pineapples are grown nearly exclusively in Hawaii, but 100 years ago Hawaii was not yet a state, and it was difficult to import fresh fruit from remote locations in the Pacific. As the southernmost section of the contiguous US and located in a desirable climate, Florida offered one of the few places to grow pineapples in addition to the indigenous citrus that is abundant in the region to this day. The Japanese community attempted to take advantage of this climate, but the soil and conditions of the specific land area proved too difficult and they abandoned their efforts just a few decades after they began. The community was named “Yamato,” a traditional name for Japan. The small section next to Delray beach still bears this name, as does nearby Yamato Road which allows access to the western portion of Delray Beach that houses the Morikami. The planned Japanese Gardens are the centerpiece of this museum. Artifacts inside the two buildings reflect centuries of Japanese culture, architecture, and beliefs, while the gardens themselves follow this same formula. A recent expansion of the gardens incorporates inspirations from different periods of history, intertwining them into differentiated sections of the grounds. The idea is to mix multiple types of landscapes, each representing different philosophies and time periods, into one seamless path around the centralized pond. This combination and natural flow allows us to capture images in many types of locales within a short span of time. We have worked here multiple times in the same month and our resulting images have displayed enough variety to suggest they were each shot in a different place. Avoiding the crowds and having strangers wandering through a photo session, couples who host their nuptials here have the facility to themselves after 5pm. The serenity and peacefulness comes across much more without a sea of tourists occupying the path. (Here the only screaming kids will be the ones whose parents you have invited to witness your celebration.) After dark, lights beam from one of the Morikami’s outbuildings illuminate the water and a line of tress in a soothing hue. This provides just enough light to add depth to the receptions photos and remind guests of the relaxing scenery in which they are vivaciously partying. Location: The Morikami Museum and Japanese Gardens, 4000 Morikami Park Rd, Delray Beach, FL 33446. 1/400; f/2.2; ISO 200; 50.0 mm.